Porochista Khakpour's book SONS AND OTHER FLAMMABLE OBJECTS was one of those rarities in our line of work -- a book worth all the hype. Her newest one, THE LAST ILLUSION, recently came out in paperback. 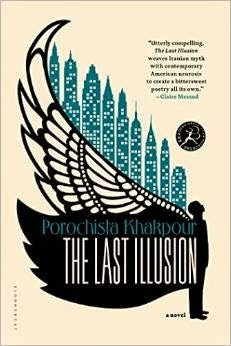 From the critically acclaimed author of Sons and Other Flammable Objects comes a bold fabulist novel about a feral boy coming of age in New York, based on a legend from the medieval Persian epic theShahnameh, the Book of Kings. In an Iranian village, Zal's demented mother, horrified by the pallor of his skin and hair, is convinced she has given birth to a "white demon." She hides him in a birdcage for the next decade. Rescued by a behavioral analyst, Zal awakens in New York to the possibility of a future. A stunted and unfit adolescent, he strives to become human as he stumbles toward adulthood. As New York survives one potential disaster, Y2K, and begins hurtling toward another, 9/11, Zal finds himself in a cast of fellow outsiders. A friendship with a famous illusionist who claims-to the Bird Boy's delight- that he can fly and an affair with a disturbed artist who believes she is clairvoyant send Zal's life spiraling into chaos. Like the rest of New York, he is on a collision course with devastation. Here she talks about the influences that brought her to that book -- or that book to her. That sounds good. I'll have to look it up. Love discovering new authors.